Modern Theosophy expresses the ancient wisdom tradition found in all religions. When H. P. Blavatsky, founder of the Theosophical Society in 1875, told English journalist A. P. Sinnett she had gained her paranormal knowledge from more evolved beings called the Mahatmas, Sinnett asked to communicate with them himself. The result was a remarkable correspondence carried on from 1880 to 1885 with Mahatmas Khoot Hoomi and Morya. Recorded in The Mahatma Letters to A. P. Sinnett, the answers of these Teachers form an essential part of Theosophical literature. At the time, the Letters stormed the bastions of racial and religious prejudice, and they continue to fascinate those seeking to probe the mysteries of the universe and the nature of consciousness. Here is the most comprehensive, magisterial discussion of The Mahatma Letters since they were first published in 1924. 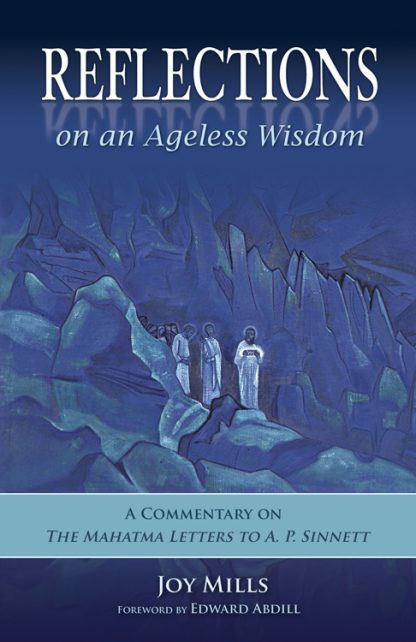 Eminent Theosophist Joy Mills bases her commentary on Vincente Hao Chin�s 1999 edition of the Letters, helpfully arranged chronologically to enable following the exposition as it originally unfolded. Mills quotes Sinnett in emphasizing that the Mahatmas� purpose was not to put the world into possession of occult knowledge but to train those who proved qualified . . . so that they might ascend the path of spiritual progress. Her focus, then, is on not only knowledge of the magnificent Occult Science but more significantly the ethical and moral values we must embrace to be of service to the world. She offers her reflections on over 140 letters in the hope that they may prove useful to fellow-students on the journey toward the spiritual heights. May these letters call you as they have continued to call me to keep on exploring, for truly there is no other way to go!